Overview: Get comfortable, loyal readers! It doesn’t get much more essential than Essential Avengers Vol. 8! The book starts out with a bang with the return of Count Nefaria, last seen taking on the “All-New All-Different” X-Men, which led to the death of Warpath. Nefaria has hired a team of scientists to increase his powers to a level where he can go toe-to-toe with Thor. However, he finds out that the increase in his powers comes at a price, as he starts to age at an aggressive rate. The team is stretched to the limits to defeat Nefaria but the battle ends with the Avengers facing a new threat – government agent Henry Peter Gyrich. We’ll get back to him soon enough. Next up is an epic battle that crosses over between two annuals, where the combined forces of the Avengers, Captain Mar-Vel, Warlock, the Thing, and Spider-Man must take on Thanos. This famous story by Jim Starline and Joe Rubinstein has been reprinted many times, including multiple Essential volumes as noted below. We then find ourselves slowly building up to the next great Avengers epic. The Guardians of the Galaxy have traveled to Earth in search of Korvac, their foe with god-like powers. While this is going on, members of the Avengers start disappearing. Are the two stories linked? This is a great story that builds up over 10 issues to an explosive conclusion. Now I mentioned Gyrich earlier. Seems he has a problem with the Avengers. Lack of security to get into the mansion. Too many people coming in and out of the line-up. Gyrich lays down the law with the team, placing new guidelines on the team in order to keep their government clearance. Gyrich not only imposes a limit of seven active members on the team, he also takes it upon himself to name the new line-up: Iron Man, Vision, Captain America, Scarlet Witch, Beast, Wasp, and the Falcon. Wait, the Falcon? We remember Captain America’s former partner, but he’s never been an Avenger before. But the government demands equal opportunities for minorities. The Falcon begrudgingly joins the team, and when the Scarlet Witch is forced to take a medical leave, she is replaced by Ms. Marvel. This gives us the new line-up for the team heading into Essential Avengers Vol. 9 and the epic Avengers #200 in the near-future. What makes this Essential? 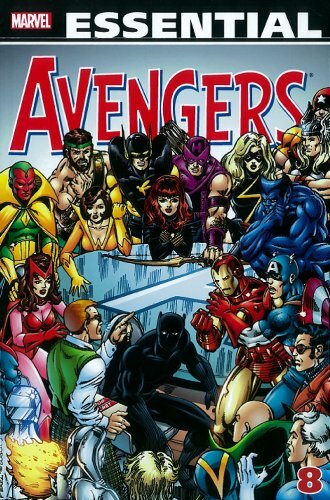 : I just love this era of the Avengers! This has to be a must-own book for numerous reasons – the stories, the artwork, the character development, and more. The introduction of Henry Peter Gyrich opens the door for the concept that the government has some control over the Avengers. The Korvac Saga storyline may be one of the best multi-issue arcs since the Kree-Skrull War. The artwork of George Pérez and John Byrne looks spectacular in black & white. Please do yourself a favor and track down this collection! Footnotes: Avengers Annual #7 was also reprinted in Essential Warlock Vol. 1. Marvel Two-in-One Annual #2 were also reprinted in Essential Marvel Two-in-One Vol. 2 and Essential Warlock Vol. 1. Even though he is announced as a new member of the team in issue #181, the Falcon does not actually join the team until Avengers #183. If you like this volume, try: the 1990s Guardians of the Galaxy series, with the first half of the series done by Jim Valentino. For many years, the Guardians had been those interesting backup group of characters, who never got the chance to really shine in their own feature. The Korvac storyline in this Essential is one of the longest appearances of the team until the launch of their own series in 1990. Along with The New Warriors, the new GotG title kicked off a new wave of youthful superheroes at Marvel. Valentino left after issue #29 to become one of the founders of Image Comics, but the Guardians title ran until issue #62. The Valentino issues were recently reprinted in three trade paperbacks, so they should be readily available to track down. This entry was posted in Avengers, Marvel Essentials and tagged Avengers, David Michelinie, George Perez, Jim Mooney, Jim Shooter, Jim Starlin, Joe Rubinstein, John Byrne, Sal Buscema, Tom DeFalco. Bookmark the permalink.